Every Windows Phone lover is waiting for the Windows 10 version in mobile and Microsoft launched this version of OS on Lumia 950 with some typical features such as Snapdragon 808 with 1.82 GHz Hexa-core processor, 5.2 inches display, 20MP & 5 MP PureView camera, 32 GB ROM with 200 GB Ext. SD card Support, 3 GB RAM and 3000 mAh battery. 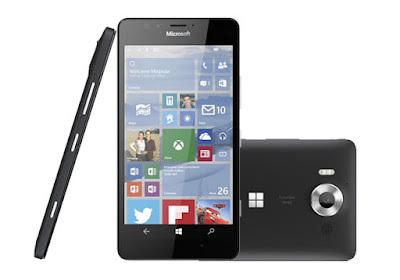 Here we will have Short review, Pros and Cons of Microsoft Lumia 950. Many High end Smartphones are built on metal (preferably aluminium) but Microsoft kept their phone built on plastic although it feels compact in hands. This phone exclusively launched by the Microsoft when the handset like Samsung S6 and Apple iPhone 6S Plus is already trending in the market with Android Marshmallow and iOS 9 respectively. This is clear from its outlook that Microsoft doesn’t change this phone to a great extent where it may look different from Lumia Series; phone doesn’t look so fresh in that mean. The left side of phone is neat and clean doesn’t have any button; right side has the volume rocker, the power/lock key and the camera shutter. On the top houses the audio jack and bottom has the USB Type-C port. Microsoft did everything to make it sure that display can deliver a crisp and pleasurable experience to users so it has 5.2 inches AMOLED display, 1440 x 2560 pixels (qHD) resolutions with 564 ppi of display density which is enough to give a delightful viewing experience. Ambient light sensor is capable to adjust its bright accordingly; so you will experience vivid colours in outdoor as well as indoor condition. to make it resistible to scratches there is Corning Gorilla Glass 3. On the department of processing unit it has Qualcomm MSM8992 Snapdragon 808 hexa-core processor with 1.82 GHz of clock speed which functions smooth with Windows 10, Microsoft introduces Continuum in Lumia 950 which makes Smartphone work like Windows 10 PC just by connecting your device with monitor, keyboard with help of proprietary Microsoft Display Dock. For same purpose Wireless Bluetooth also works. Other brands are mostly including fingerprint sensor for the security but Microsoft avoided this and introduces its iris-scanning biorecognition software; this takes your eyes retina as the password although it is under beta condition still it works close to perfect even in low lightning. As compare to Android and iOS the windows store still lag behind although most of the useful and popular software are available in Windows store too. Combination of Snapdragon 808 + 3 GB RAM + Windows 10 OS makes this phone coherent. Most interesting and impressive features of this phone is its 20 MP PureView camera with OIS and f/1.9 aperture, which is capable of snapping a living photos closer to natural. Triple LED Natural Flash balances the brightness of scene. It has lots of manual setting PureView technology, geo-tagging, face detection, panorama, HDR etc. The quality of photos taken from the primary camera is lucid and veritable. 5 MP front camera also doing good job for taking some cool selfies. Phone support 4K videos for sharper videos in highest possible resolution. Windows OS is known for using lesser battery juice as compare to power hungry Android, Lumia 950 also has USB-C Fast Charging can charge up to 80% + capacity with just 60 minutes of charging. Although OS is optimized to make lesser load on the battery consumption which can give over a full day backup but the features like 4K videography and IRIS unlock scanner drains battery faster. This device also has Microsoft Wireless Charger facility. It also has iris-scanning biorecognition. Built-in wireless & fast charging. It does support OTG cable. The build quality and feel is not up to our expectation. App Store needs to be improved. Not disadvantages but you miss fingerprint sensor, waterproof body and metallic body. Microsoft appended all the possible best features in Lumia 950 from camera, processor to battery. You will definitely feel pleased after getting it in your hand. They also freshly introduced Windows 10, Continnum and Iris scanner. Lumia 950 proof itself as master piece in smartphone world. The price at the time of launching looks little bit higher but we hope it will go down after couple of weeks.